During Arizona’s mining surge in 1879, the town of Casa Grande was founded and named after the Hohokam ruins. 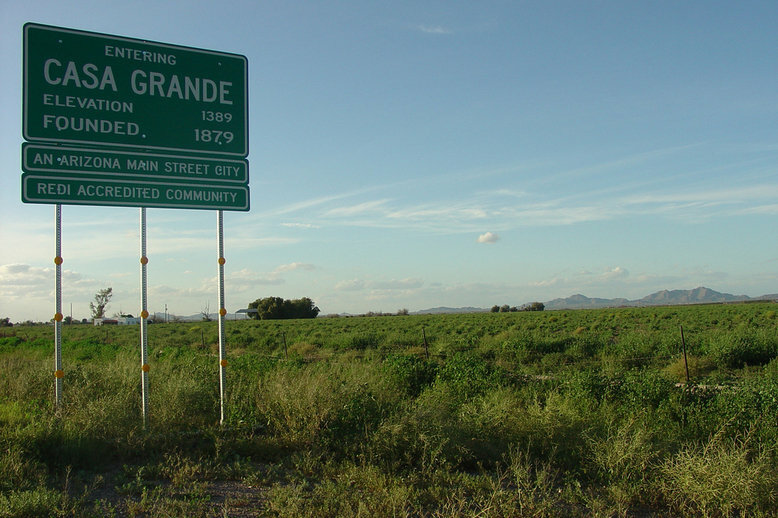 It wasn’t until 1915 that Casa Grande became incorporated. Many of the places around town were named after one of the founding fathers, Thompson Rodney Peart, (Peart Road, Park and Center). A major railroad terminated in town and earned the name, “Terminus”. Casa Grande was mostly a farm town, but can boast the first exhibition baseball game in 1961. Willie Mays hit a 375 foot home run on that field. All that remains today of the past ballgames is the pool in the shape of a baseball bat and ball. I did not know that the mountains were haunted.....bonus!!! I would love to check out another abandoned motel. There is something eerie about an empty worn out motel that makes it an interesting subject to take photos of. I wonder what kind of reading you will get at this one. I guess we have to wait and see. I will be wearing my sneakers just in case we have to leave someplace in an all-fire hurry, lol. sounds eerie! there should be a lot of residual energy there. can't wait to see what you find. Yay! Looking forward to what kind of things the two of you are going to get in to! TROUBLE is what I'm thinking! DAMMIT I wish I was there! Have fun and BE SAFE!